Every day, many people get arrested in Los Angeles. Among these arrests, almost all of them are bailable. Having the knowledge of bail bonds is very important in these situations. That's where our bail bonds agency comes in. Our Los Angeles Bail Bonds is proud that they are spreading the knowledge of bail bonds everywhere. Despite our business, we are dedicated to educate people about bailout process. With our fast and reliable bail services, you can bail out friends or family in a matter of a few hours. We provide these services all over Los Angeles. Our headquarters is located near downtown Los Angeles. We cover every jail in the county of Los Angeles. We are available 24 hours everyday throughout the year. Our agency is easily accessible near where you live. Los Angeles Bail Bonds is a part of a foundation in California in order to help people to get their loved ones back to their family when bad things happen. 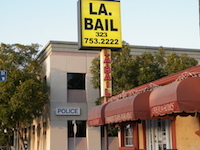 Our legal services are known to be unique when fast bail bond services has large demands. Our Los Angeles office has been around for more than two decades and is dedicated to providing its customers with the highest level of legal services. We negotiate with our customers to agree on the best outcome that will always benefit them. For information about the services that are offered in Los Angeles County, visit our information table below. You can also find information about police, jail and courts in the table below. Navigate each tab to find the desired information. 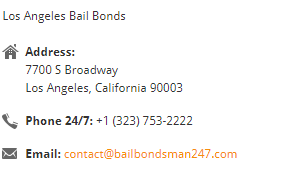 Our bail bondsmen are available 24/7 to bail out your loved ones; No matter where you are in US. Our bail agents are on call 24/7. Your message has been successfully sent. We will get back to you as soon as possible! Your message couldn't be sent because it was identified as spam. Please stop sending spam! Copyright © 2019 - 24/7 Bail Bondsman. All rights reserved.